State Sen. Juan "Chuy" Hinojosa, D-McAllen, was named a UTRGV 2018 Distinguished Alumni on March 1, 2018, in McAllen. 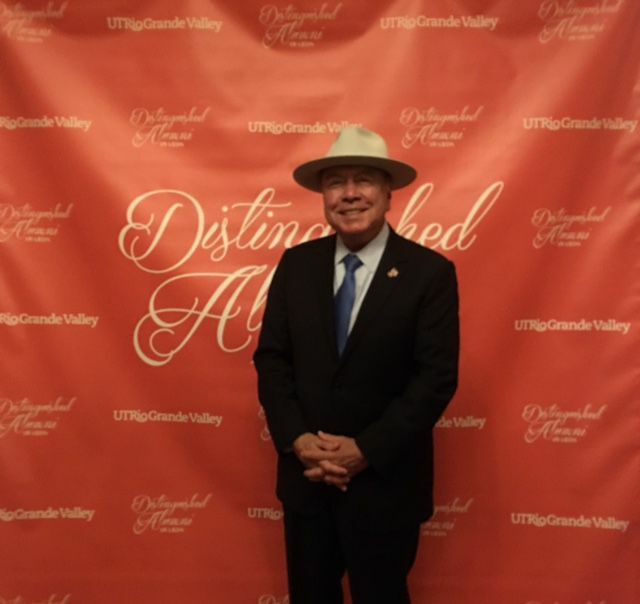 Congratulations to state Sen. Juan “Chuy” Hinojosa who is among three people named as the University of Texas Rio Grande Valley’s 2018 Distinguished Alumni for their service to our Valley region. Sen. Hinojosa, along with Gen. William E. Garrison, a retired major general of the U.S. Army, and Welcome Wilson Sr., chairman of the GSL Welcome Group real estate development firm, of Houston, were honored Thursday night at an awards dinner in McAllen. The Distinguished Alumni Award “is the highest honor UTRGV alumni can receive,” a UTRGV news release said. It recognizes prestigious, outstanding and notable graduates of UTRGV and its legacy institutions. It honors high-achieving individuals who stand out in their fields and have made significant contributions to society. Recipients of this award have honored the legacy of excellence at UTRGV and its legacy institutions through their accomplishments, affiliations, careers, and philanthropic endeavors. These three certainly are deserving of this “highest honor” that our Valley’s burgeoning university has to bestow. Hinojosa has worked tirelessly with his fellow legislators to help get more money for UTRGV and its new School of Medicine. This last session was quite a struggle, with lawmakers initially wanting to give far less funding than the institution needed, only in the single-digit millions, but Hinojosa led the charge and convinced lawmakers to eventually pass a budget that appropriated over $54 million to UTRGV. Indeed, Hinojosa has long been a champion for improving education, on all levels, within Texas, and in particular in the Rio Grande Valley. “I am honored and humbled to be recognized by my alma mater with the Distinguished Alumni Award. I have dedicated my legislative career to improving our education system and increasing access to higher education opportunities for our region. Education is the best equalizer we have in our society. Education gives you knowledge, and knowledge gives you the power to succeed,” Hinojosa said in a news release. Hinojosa enrolled at Pan American College after serving in Vietnam as a U.S. Marine. He was graduated in 1970 with a bachelor’s degree in political science. In 1989, as a member of the Texas House of Representatives, Hinojosa was the lead sponsor of the legislation that merged Pan American University and Pan American University at Brownsville with The University of Texas System. In 1997, as a member of the Appropriations Committee in the Texas House, Hinojosa secured $30 million for the construction of the Regional Academic Health Center in Harlingen, paving the way for the creation of a medical school in the RGV. In 2013, he authored and helped to pass Senate Bill 24, the legislation that merged UT-Pan American and UT-Brownsville into UTRGV and created a free-standing medical school. Since its creation, UTRGV has transformed our Valley, connecting communities from the Upper and Lower Valley like nothing else has before. Congratulations to all who have contributed to this institution. And many thanks.